When evening falls over Shanghai, the halo of the moon polishes giant skyscrapers and beads river waters with drops of gold and jade. A black tea with handsome, finely work leaves is blended with a grand bouquet of fruity, flowery, vanilla flavours that honour an ultramodern, newly cosmopolitan city. 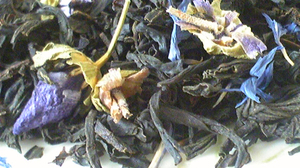 Similarly, the cup has contrasting overtones-simultaneously mild and perfumed, smooth and very slightly peppery.